With the onset of cold weather, more people think about the reliability of heat their homes, replacing the old radiators (usually iron) With new ones. 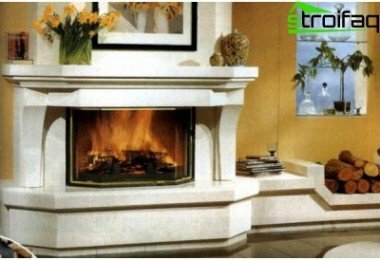 In such a situation it is important to orient and from the variety of heating devices of different price range and specifications, to choose the best. 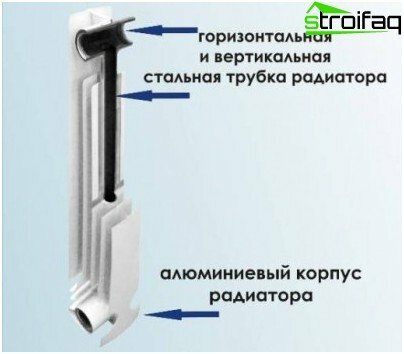 Radiators Bimetallic quite affordable for the middle class, have a number of advantages and may become the most preferred choice option for many. 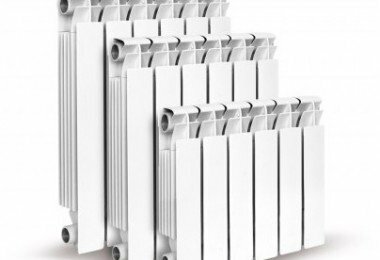 Bimetallic radiators: how to choose? 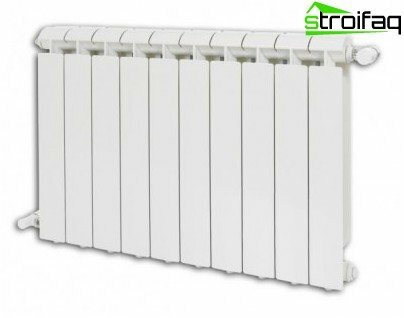 The main drawback of the radiators of this type are the same: the price by 15-20% in excess of the price of the aluminum counterparts. In the context of a particular house, not all radiators may be suitable for the job. the coolant used in the system (if the water is used, it is important that the temperature). 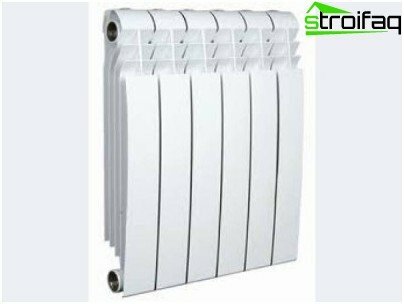 Choosing the radiators should be based on 3 main parameters: heat transfer, the ability to withstand the necessary pressure and design. 1. Pressure. Immediately discard those whose performancepressure less than set in your home. They must also be designed to limit the test pressure (ie the pressure "on the limit"). In this respect, radiators Bimetallic very reliable. For some models capable of withstanding up to 35 atmospheres. This is despite the fact that in the old brick house (not more than five floors), the pressure will be not more than 8 bar, in a modern nine-panel - 9 - 10 atmospheres. 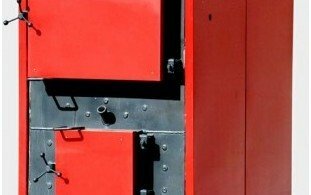 Therefore bimetallic battery is better to establish where additional security is required: in high-rise buildings on the upper floors or in the workplace. 2. Also, it is important heat irradiation (thermal power). The "deep" and below the radiator, the more uniform temperature distribution achieved in the premises, as well as - more efficient heating of the entire volume of air. Choose the battery with greater depth, the more important it is if you are going to install it into a niche. The distance between the floor surface and the bottom of the device must be at least 60 mm, the clearance between the sill and the upper portion - not less than 100 mm. Calculate the width of the radiator, which is planning to place under the window, less than 50 - 75% of the width of the opening. Otherwise not be able to create an "air curtains" a stream of warm air and the cold air coming from the window, will go down into the room on either side of the radiator. 3. Design this device too is important. Its appearance should match the interior room. All differences in design depend mainly on the size of center distance, which is 350 to 500 mm, or more often. Depending on the model of the bimetallic radiator manufacturer and one section of the heat capacity can be from 120 to 190 watts. Accordingly, if we need to heat the room10 square meters, it is advisable to buy a 9-10-sectional radiators with a capacity of one section of 120 W or 5-6-section with a capacity of one section of 190 watts. Important! Do not try to buy a multi-sectional heatsinks (over 10 sections). For service expanses better buy a few batteries with a small number of sections. All major heat loss, which are subject to residential premises are: warm, drifting through the windows, as well as through walls and confused on the way to the batteries. if you plan to regularly ventilate the room in winter, the radiators should be taken with a stock - more to 1 or 2 section. Important! If possible, install the thermostats battery. 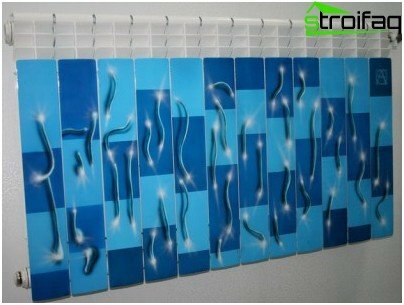 Depending on the actual room temperature, they will adjust the radiator temperature automatically. You can always maintain optimum temperature. When calculating sections is better to proceed from onesimple rule: excess heat better than the lack of it. The winters are unpredictable, and they can be very chilly in central Russia. Therefore, the calculation of bimetallic radiators perform better with a margin. If the funds do not allow you to set thermostats, try to have at least valve to bypass and valve, shut off the flow of water. Blocking one valve half and completely covering the other may adjust the radiator heat gently. 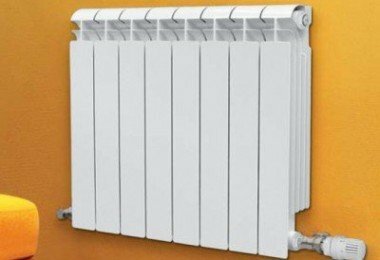 Best - a "correct" radiators, in whichAll internal parts in contact with the coolant directly to the 100% made of steel, the best - stainless. It is due to this possible high corrosion resistance (as the stainless steel is not subject to corrosion) and resistance to changes in pressure. 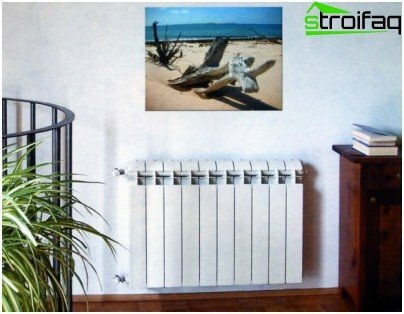 As a rule, high-quality radiators famous Italian manufacturers, for example, of Royal firms and Global Style. The actual life of such units is 40-50 years. But many Chinese firms, and somedomestic manufacturers are made of steel only a small part of the internal parts of the heaters. What if this happens? And the fact that the coolant is in contact with the aluminum compound and the points of steel, reducing the corrosion resistance of the radiator. In this half-metallic aggregate, by and large, is not much use as metal corrosion processes in it no less intense than in the aluminum counterparts, and pay not for that. After all, the main advantage of bimetallic devices to aluminum is that the former have a higher corrosion resistance, and therefore durability. 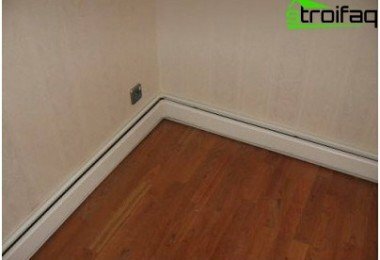 It is known that the heat carrier medium can be very aggressive, able to break down the walls of the heater for a few years. So try to acquire bimetallic battery trusted manufacturers do not buy with it, check the specifications and the warranty of the manufacturer. In conclusion we note that the benefits inbimetallic radiator lot. The main thing - the right to choose the device that is suitable for your room. To avoid problems with the installation, it should be defined in advance, with its dimensions, find diameter of lead pipes and fittings to get their scheme to the radiator: from the floor (one pipe, or both) or below the skirting board or floor, in the back of the wall, side, top. 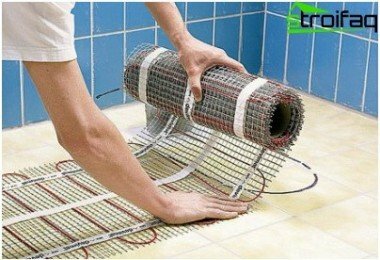 In carrying out the repair and replacement of the heating devices is important to know the exact center distance, measured between the holes, which will be carried out eyeliner. If you are sure to possess all this information, you will be able to avoid unnecessary costs and hassle associated with installing different adapters, this will facilitate the selection of the necessary accessories.